How Long Can Hard-Boiled Eggs Be Left Unrefrigerated? Salmonella is the most common form of food poisoning in the United States, and contaminated eggs cause approximately 142,000 cases of salmonella in the United States each year, according to the Centers for Disease Control and Prevention. Refrigerating your eggs properly will help to prevent contamination. Leaving hard-boiled eggs at room temperature for extended periods of time allows for dangerous bacteria, including salmonella, to grow at a rapid pace. FoodSafety.gov states that foodborne pathogens grow quickly between 40 and 140 degrees Fahrenheit, commonly known as the danger zone. Average room temperature ranges from 68 to 77 degrees Fahrenheit. Refrigerators store foods below 40 degrees Fahrenheit, slowing the rate of bacteria growth. If your refrigerator does not have a built-in temperature gauge, you can purchase an inexpensive refrigerator thermometer from a kitchen supply store. According to the Centers for Disease Control and Prevention, you should discard any perishable foods, including hard-boiled eggs, that have been left at room temperature for longer than two hours. The two-hour guideline applies to eggs you have just cooked as well as chilled hard-boiled eggs taken out of your refrigerator. During the hot summer months, or any time the temperature exceeds 90 degrees Fahrenheit, throw out any perishable food left outside of refrigeration for more than one hour, FoodSafety.gov recommends. Since hard-boiled eggs are cooked, you may believe they are safer than raw eggs. 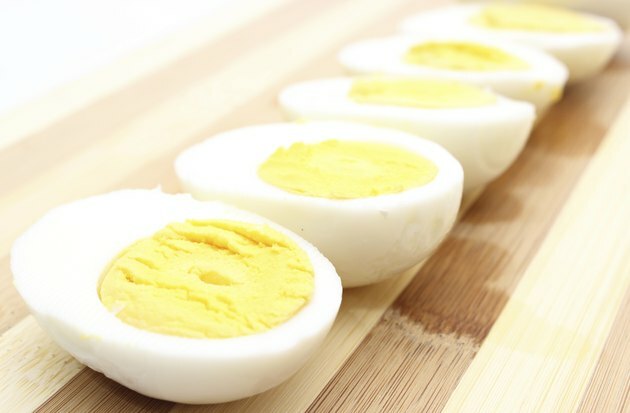 According to the Academy of Nutrition and Dietetics, hard-boiled eggs are actually more susceptible to bacterial contamination because the cooking process damages a protective layer on the shell of the egg. Keep your hard-boiled eggs safe by refrigerating them immediately after cooking them, and eat them within one week. What Are the Dangers of Eating Expired Eggs? Are Pasteurized Eggs Safe to Eat Raw?